Does a Commitment to Community Support Make an Impact? At VITAL WorkLife, I am so proud we have a commitment to community and to supporting well being initiatives important to us as employees. Back in January of 2010, my father, Robert Hale, suddenly found himself in the hospital. He had been feeling tired but on that particular day could barely walk a hundred yards without turning white and feeling totally exhausted. Turns out his blood counts were significantly below normal due to Acute Promyelocytic Leukemia (APL). When you hear the word leukemia, it is a bit unsettling knowing it is a type of cancer. While one thinks leukemia is normally a childhood illness, my dad quickly learned this is not the case at all. Leukemia is a blood cancer caused by a number of things, but it is an attack on one's bone marrow where blood is manufactured. With the especially skewed blood levels he had at the time, one doctor said if he would have had open cuts as the result of, say a car accident, he may well have died. On the other hand, the oncologist assigned to my dad tried to provide comfort by stating the success rate for APL was 90%. Of course, Dad wondered if it was possible he would be part of the other 10% a pretty scary thought. Then the next question was, “What exactly did she mean by success?” It took a day or two for everything to sink in and become more real, all at the time Dad was in the ICU surrounded by bags, tubes and monitors, confused about what happened and what was going to happen. Five weeks later, Dad was released from the hospital, but still undergoing chemo therapy at home until sometime in May when he was declared to be in remission. Thankfully he was part of the 90% his oncologist told him about five months earlier. During his hospital stay, and the following months at home, Dad started to do some research, since he had nothing better to do. Along the way, someone mentioned the Leukemia and Lymphoma Society (LLS), which he included in his research. What he found was a support group for those in treatment, in remission, or sadly, in mourning. Dad also found news of research being done, stories of successes and promising patterns of positive results. Then Dad realized LLS may well have been involved in supporting and partially funding the research resulting in his own success, that 90%! 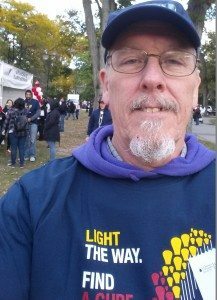 Ever since then, my Dad has participated in the Leukemia and Lymphoma Society’s Light the Night fund raising campaign. This year he was again able to get support of friends, family and co-workers to raise more than $1,000. Some of his contributors have made donations through their companies’ match programs, as I did with the help of VITAL WorkLife. If you or a family member are struggling with the demands of an acute or chronic illness or another life challenge ­– whether personal or in the workplace ­– your Employee Assistance Program (EAP) from VITAL WorkLife can help. Call 800.383.1908 to learn more or to speak with one of our representatives. We’re available anytime, day or night. VITAL WorkLife, Inc.™ is a national behavioral health consulting company providing support to individuals facing life’s challenges, while also assisting organizations in improving workplace productivity. This approach of helping employees and their families, while also guiding organizations, builds healthy, sustainable behaviors. For over 30 years, we have offered industry leading Employee Assistance Programs, specialized support, training and consulting for a wide variety of industries.